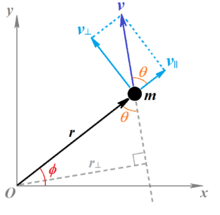 The definition of angular momentum for a point particle is a pseudovector r×p, the cross product of the particle's position vector r (relative to some origin) and its momentum vector p = mv. This definition can be applied to each point in continua like solids or fluids, or physical fields. 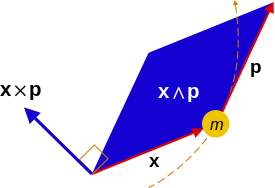 Unlike momentum, angular momentum does depend on where the origin is chosen, since the particle's position is measured from it. The angular momentum of an object can also be connected to the angular velocity ω of the object (how fast it rotates about an axis) via the moment of inertia I (which depends on the shape and distribution of mass about the axis of rotation). However, while ω always points in the direction of the rotation axis, the angular momentum L may point in a different direction depending on how the mass is distributed. Angular momentum is additive; the total angular momentum of a system is the (pseudo)vector sum of the angular momenta. For continua or fields one uses integration. The total angular momentum of anything can always be split into the sum of two main components: "orbital" angular momentum about an axis outside the object, plus "spin" angular momentum through the centre of mass of the object. Torque can be defined as the rate of change of angular momentum, analogous to force. 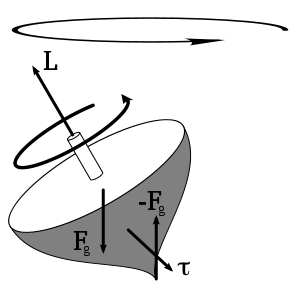 The conservation of angular momentum helps explain many observed phenomena, for example the increase in rotational speed of a spinning figure skater as the skater's arms are contracted, the high rotational rates of neutron stars, the falling cat problem, and precession of tops and gyros. Applications include the gyrocompass, control moment gyroscope, inertial guidance systems, reaction wheels, flying discs or Frisbees and Earth's rotation to name a few. In general, conservation does limit the possible motion of a system, but does not uniquely determine what the exact motion is. In quantum mechanics, angular momentum is an operator with quantized eigenvalues. Angular momentum is subject to the Heisenberg uncertainty principle, meaning only one component can be measured with definite precision, the other two cannot. Also, the "spin" of elementary particles does not correspond to literal spinning motion. and is the mass of the particle. which is the cross product of the position vector and the linear momentum of the particle. By the definition of the cross product, the vector is perpendicular to both and . It is directed along the axis of rotation as indicated by the right-hand rule – so that the rotation is seen as counter-clockwise from the head of the vector. Conversely, the vector defines the plane in which and lie. Similarly, a rotational analogy of Newton's Second law of Motion might be, "A change in angular momentum is proportional to the applied torque and occurs about the same axis as that torque." Since a torque applied over time is equivalent to a change in angular momentum, then if torque is zero, angular momentum is constant. As above, a system with constant angular momentum is a closed system. Therefore, requiring the system to be closed is equivalent to requiring that no external influence, in the form of a torque, acts upon it. Conservation is not always full explanation for the dynamics of a system but a key constraint. 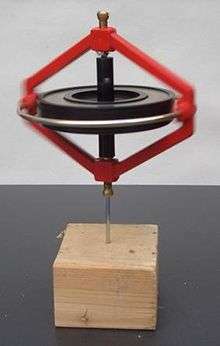 For example, a spinning top is subject to a gravitational torque making it lean over and change the angular momentum about the nutation axis, but neglecting friction at the point of spinning contact, it has a conserved angular momentum about its spinning axis, and another about its precession axis. Also, in any planetary system, the planets, star(s), comets, and asteroids can all move in numerous complicated ways, but only so that the angular momentum of the system is conserved. The angular momentum of the particles i is the sum of the cross products R x MV + Σri x mivi. bottom: momentum p and its radial position r from the axis. The total angular momentum (spin plus orbital) is J. For a quantum particle the interpretations are different; particle spin does not have the above interpretation. The classical definition of angular momentum as can be carried over to quantum mechanics, by reinterpreting r as the quantum position operator and p as the quantum momentum operator. L is then an operator, specifically called the orbital angular momentum operator. The above identities are valid locally , i.e. in each space point in a given moment . 1 2 Taylor, John R. (2005). Classical Mechanics. University Science Books, Mill Valley, CA. p. 90. ISBN 1-891389-22-X. ↑ Oberg, Erik; et al. (2000). Machinery's Handbook (26th ed.). Industrial Press, Inc., New York. p. 143. ISBN 0-8311-2625-6. ↑ Oberg, Erik; et al. (2000). Machinery's Handbook (26th ed.). Industrial Press, Inc., New York. p. 146. ISBN 0-8311-2625-6. ↑ Oberg, Erik; et al. (2000). Machinery's Handbook (26th ed.). Industrial Press, Inc., New York. pp. 161–162. ISBN 0-8311-2625-6. ↑ Stephenson, F. R.; Morrison, L. V.; Whitrow, G. J. (1984). "Long-term changes in the rotation of the earth – 700 B.C. to A.D. 1980". Philosophical Transactions Royal Society. 313 (1524): 67. Bibcode:1984RSPTA.313...47S. doi:10.1098/rsta.1984.0082. Retrieved 2015. Check date values in: |access-date= (help) +2.40 ms/century divided by 36525 days. ↑ Landau, L. D.; Lifshitz, E. M. (1995). The classical theory of fields. Course of Theoretical Physics. Oxford, Butterworth–Heinemann. ISBN 0-7506-2768-9. ↑ Battin, Richard H. (1999). An Introduction to the Mathematics and Methods of Astrodynamics, Revised Edition. American Institute of Aeronautics and Astronautics, Inc. p. 115. ISBN 1-56347-342-9. ↑ Okulov, A Yu (2008). "Angular momentum of photons and phase conjugation". Journal of Physics B: Atomic, Molecular and Optical Physics. 41 (10): 101001. arXiv:0801.2675 . Bibcode:2008JPhB...41j1001O. doi:10.1088/0953-4075/41/10/101001. ↑ Newton, Isaac (1803). "Axioms; or Laws of Motion, Law I". The Mathematical Principles of Natural Philosophy. Andrew Motte, translator. H. D. Symonds, London – via Google books. ↑ Hayward, Robert B. (1864). "On a Direct Method of estimating Velocities, Accelerations, and all similar Quantities with respect to Axes moveable in any manner in Space with Applications". Transactions of the Cambridge Philosophical Society. University Press, Cambridge. 10: 1. Bibcode:1864TCaPS..10....1H. ↑ see, for instance, Gompertz, Benjamin (1818). "On Pendulums vibrating between Cheeks". The Journal of Science and the Arts. James Eastburn & Co., New York. III (V): 17 – via Google books. ; Herapath, John (1847). Mathematical Physics. Whittaker and Co., London. p. 56 – via Google books. ↑ see, for instance, Landen, John (1785). "Of the Rotatory Motion of a Body of any Form whatever" (PDF). Philosophical Transactions. Royal Society, London. LXXV (I): 311–332. doi:10.1098/rstl.1785.0016.